Accord­ing to report­s, civil admini­strati­on comple­tely failed to contro­l the situat­ion. ISLAMABAD: The Supreme Court hearing of the sou motu case regarding Saturday’s Quetta carnage that killed over 80 people is underway. Earlier, Express News reported that the chemicals used in the bombing were purchased from the Akbar mandi market in Lahore. The country’s top court is going through an intelligence report submitted by the federal secretaries for interior and defence, and the Inter-Services Intelligence (ISI) on Wednesday. According to the report, the civil administration completely failed to control the situation. The exchange of confidential information has since led to 130 operations against terrorists. Justice Arif also expressed outrage towards the absence of the Secretary of Defence and the summoned Balochistan police officials who were not present in the courtroom. Not satisfied with the response given by the authorities on the failure of the intelligence agencies to curb terrorist attacks in Quetta, Chief Justice Iftikhar Muhammad Chaudhry asked the government to submit a detailed report assessing the competence of the intelligence agencies by Wednesday. The Governor of Balochistan and Chief Secretary Balochistan also submitted their replies to the court. The bench, however, expressed dissatisfaction over their responses. 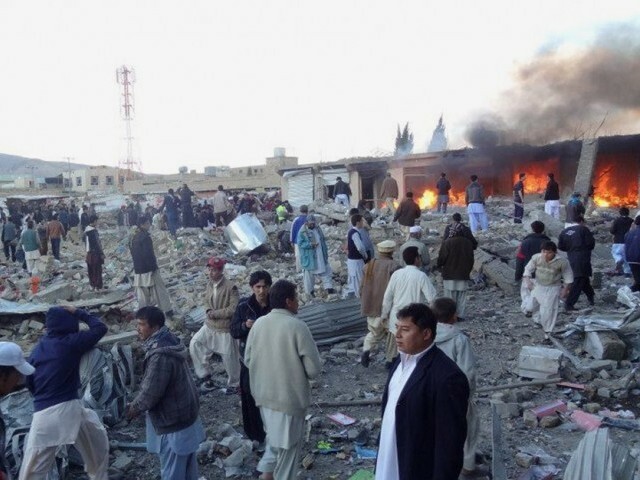 The blast that took place on Saturday, February 16 targeted the Shia Hazara Community in Quetta. The blast sparked countrywide protests and mourning in solidarity. Pakistan’s top judge, Chief Justice Chaudhry took suo moto notice of the brutal bombing earlier this Monday. The suo motu notice was taken on a notice forwarded by the SC Registrar’s office. Led by a three-member bench, the hearing began on Tuesday, February 19. The apex court had formed the committee to see that its directives were implemented. PM removes Inspector general (IG) Balochistan Umer Khitab. If Balochistan Police officials are to be present in the SC, who will look after the situation in the province?.The situation should be allowed to worsen to pay respect to the CJ. Very convenient for intelligence agencies to blame it all on the civil administration. Isn’t apprehending terrorists and preventing plots the job of the agencies? Speaking in a matter you have no knowledge of, makes you look like a foolish dumb person. Your comment is nonsensical. If present Government had anything else than corruption, it could have established a coordination cell for all the agencies to coordinate with each other to preempt the terrorist attacks. @Fahad Ali Khan: what did he say that was so wrong? Ad Hominem attack makes one come across as a bully. What a joke?! Balochistan is run by the army. The Frontier Corps is commanded by serving army officers and they are blaming the civilian administration? Had IGFC been suspended by the Courts like IG police, NAB officers and civil bureaucrats are suspended time and again; this would have not come to pass. For every one bomb blast , 10 or more are averted silently. No one mentions them or praises or acknowledges the acts and sacrifices of those who avert the blasts. Lets not pressurise the intelligence team too much. Please apprise about your knowledge/information of the matter to draw relevant conclusion. Good thing that intelligence agencies are being challenged and asked tough questions. They (intelligence) are either foolish or simply work against the nation. If you disagree with persons opinion then provide your logic on why you disagree, or simply say that you disagree. Why call names? @Fahad Ali Khan @Muneer @Ejaaz : three of you are worried about the out come of mess in Quetta generally, but please hold hand of each other and find ways to overcome and not hurting each other. Hugs to you three. How can one thing walk from Lahore to Quetta, what were the intelligence agencies doing ? They were doing the walking, while others were doing the talking. @Mj: No, job of agencies is to provide intelligence to law enforcement authorities (like Police). Police have to properly use that info to arrest the suspects. One has to buy large quantities of chemicals to make larger and more lethal bombs and yet the dealers in Lahore did not suspect why some one needs so much chemicals, there should be a law not banning the legitimate use of chemicals but it should be reported immediately to the concerned authorities. In the US, although fertilizers are used widely in the farming communities but some one not a farmer buying large quantities are reported to the police , these steps were taken after the Oklahoma City bombings and it has worked ever since. This same principle could be applied in Pakistan’s chemical industry and the supplier should be liable for not reporting the larger than usual sales.Hopefully this carnage of innocent people got to stop at some point and tax payers money is not wasted on these incompetent intelligence agencies. It is not the responsibility of ISI but IB on federal level and all provincial Intel agencies….why IB is not being talen to task….IB is reponsible for all internal Intel and counter terrorism actions and is under PM and reports to minister of interior….you want to confirm this visit Pakgovt web site….. I I don’t know when unity,faith &discipline will be ordered in our all intelligence and security forces by our high ups in the interest of the country.